This arcade game takes you to the candy store for a wild game of tag with some of the rowdiest playmates you'll find anywhere. If you can eat all the sweets, the bratty kids will stop bothering you and after a quick stop and a brushing of the teeth, it's off to the store for another day of sweets and tag. After On-Line Systems won its lawsuit over Gobbler being a Pac-man clone, they remade the game, using smiley faces ("little brats") instead of ghosts, and replacing Pac-man by a set of teeth. The result was Jawbreaker, developed by John Harris. Sierra was once again threatened with legal action due to the resemblance but it never went to court. That may however be one reason why the mazes in its successor, Jawbreaker 2 were made entirely different. 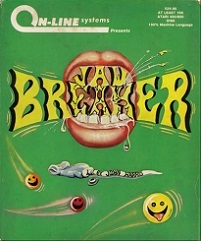 Jawbreaker was first released for the Atari 400/800 and then ported to the Apple II.